What do you make with those huge zucchinis from the garden? 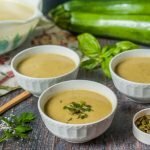 Thai curry zucchini soup is a breeze in the Instant Pot and so very tasty! You can make it in the slow cooker too. Best of all you only need 5 ingredients to make this rich and flavorful soup. Add all of the ingredients to your Instant Pot and then secure the lid. Turn the venting nozzle to the back to create pressure. Set the manual button for 10 minutes. When done, quick release the pressure by turning the nozzle to the front. Once the steam has stopped, open and then pour the soup into your blender in batches. Puree until the soup is smooth and creamy. To make this in a slow cooker, just add all the ingredients and mix. Cook on high for 4 hours or low for 8 hours and then puree in your blender at the end. Notes: You can use either a blender or a stick blender to puree the soup at the end. You can also make this on the stove. Just cook until the zucchini is very tender and then blend at the end.